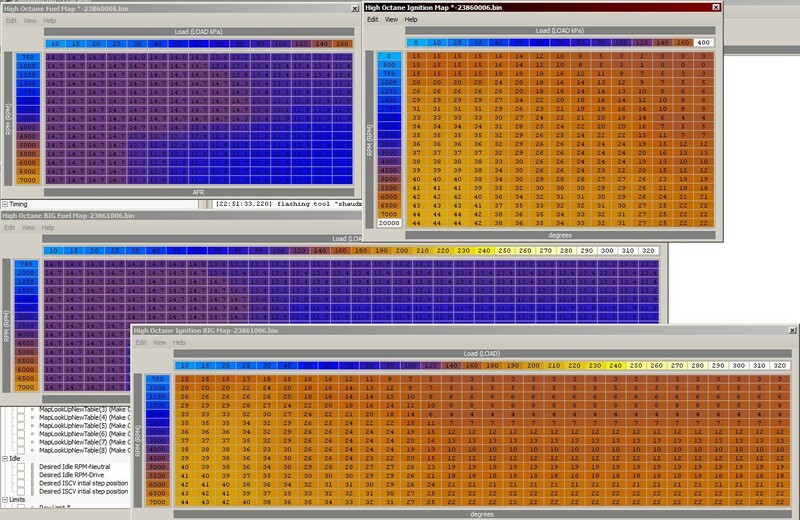 The stock fuel map is only 15×15 cells and the stock timing map is also a pitiful 20×15 map. What I’ve done with the big maps is combined unused/unnecessary maps in the ROM and made 4 15×30 cell maps. All 4 big maps share the same axis and they are completely independent from the rest of the ROM so you are free to scale them however you’d like. These maps are a translation from a the stock ROM and are not modified in any way. My EVOScan file is setup to log the RPM and Load addresses the ECU uses to look up these tables so tuning is more accurate. Fuel injectors have to physically move the pintall from the seat before fuel can flow. This take a finite period of time and which changes as the battery voltage varies. As the voltage is lowered, the time required to lift-off or open is increased. There is also a corresponding time delay when the injector is de-energised to the actual fuel shut off. This closing period is much shorter than the opening time and the closing period gets shorter as the battery voltage is raised. The combination of these parameters is called INJECTOR LATENCY. Different make and model injectors will have different latency specifications. 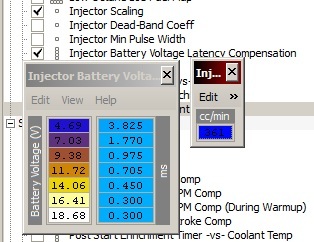 The only two values you need to modify are the Injector Scaling and Battery Latency Comp tables when installing larger injectors. The other tables are just there for learning purposes and can be ignored. Setting the scaling is simple. Just enter the rated size of the injectors you are running for pump gas. If you’re running E85, take the rated size and multiply it by .7 and use that number. This will add 30% enrichment needed for burning alcohol. The latency requires a little bit of research. This table is a great reference! Note: You can rescale the voltage side of the table to match the chart if you please. Injector Latency scaling equation is a function of the Injector Dead-Band Coefficient. There’s no need to modify this value. It’s needed for figuring out which Latency Scaling the table lookup value is used. Consult Merlin’s guide for fine tuning these settings. 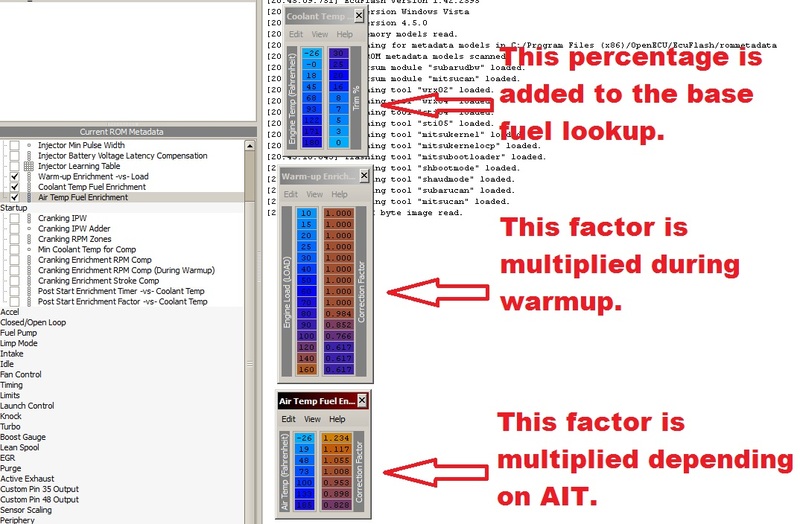 There are a number of temperature enrichment factors to the base fuel table. One factor is coolant temp. This is the warm up enrichment table the ECU applies to the mixture. I highly recommend at least reducing the values in this table if you are installing larger injectors. Example: If you’re running 680s, reduce the trim by half since they are 2x the size of stock injectors. Haven’t ever really needed to adjust the bottom two tables. The load based correction is in place to eliminate enrichment during warmup at high loads so you don’t run too rich during high acceleration. The air temp table is just an overall fuel correction. Since cool air is denser, more fuel is needed to maintain the same AFR.